Vat Ong Teu, Vientiane. Photo Credit: Phoonsab Thevongsa. 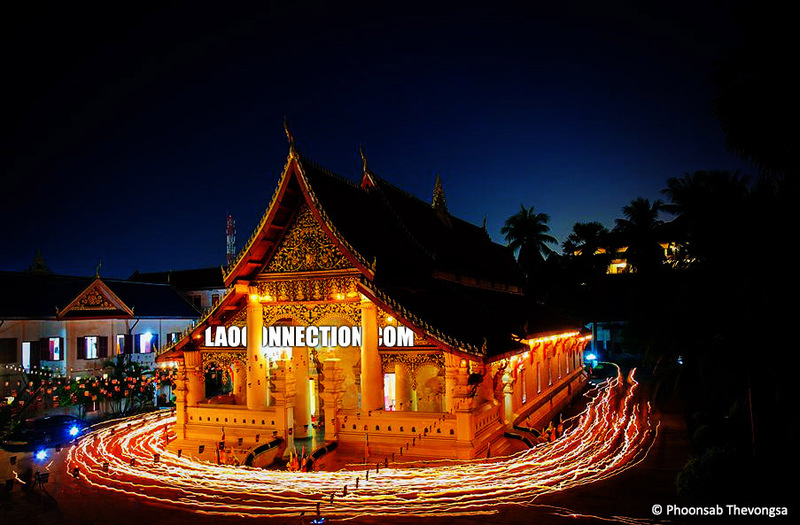 Many of the activities surrounding Lao New Year involve the Buddhist temple. When sunset arrives, people congregate at their nearest neighbourhood temple to perform this activity called vien tien, in Lao, ວຽນທຽນ. People often arrive with their own candles and begin lighting them. A prayer and blessing is said by the monks and from there, the monks lead the procession around the temple. The circumambulation happens three times around the temple. As shown in this long exposure late evening photograph, the candles appear as long strings of light as monks and lay followers perform the candle lit walk.